Watch Knights of Ni grow up. If you have not done yet you should read the upgrade guide to Nikola v8. NoN works with v7 and v8 nonetheless. NoN is basically a Python script with a GtkBuilder GUI so in general you can get it running by executing non.py. Use the uninstall command to revert installation. The configuration is stored in easy readable YAML format. As of now there are only bookmarks and the last working directory stored. Editing or removing bookmarks can only be done here (GUI solution is on the roadmap). Application has been sped up by storing the sites (meta) data in a JSON formatted file. If a conf.py and the corresponding site is loaded into the application for the first time the data will be indexed. This initial task can take some time. On every next refresh/start this data will only be checked for changes and updated. 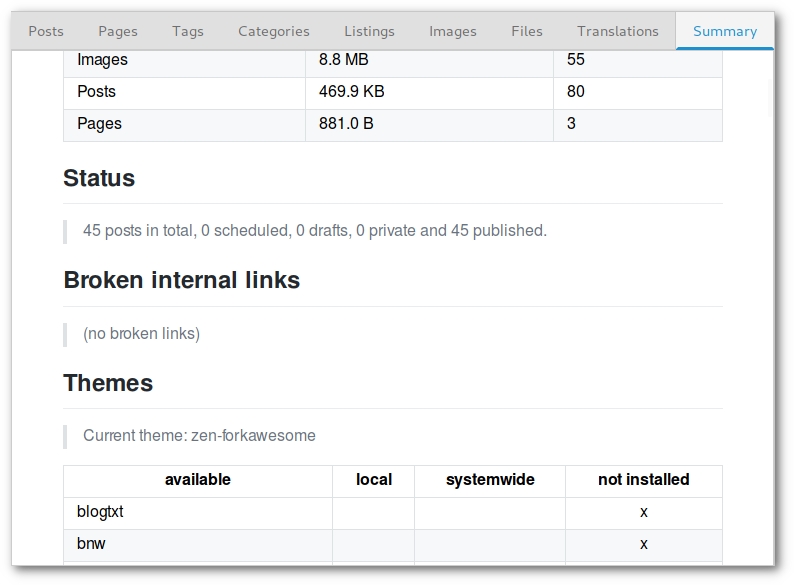 The CSS used is imitates GitHub style, credit goes to sindresorhus/github-markdown-css. The summary is generated when initially indexing the site. Choose the menu item to generate a new report. There is now a translation template file (POT) waiting for translation. In case you have German localization, don't be irritated, there are only some strings translated yet. The default input format of Nikola is reStructuredText but it supports various other formats. 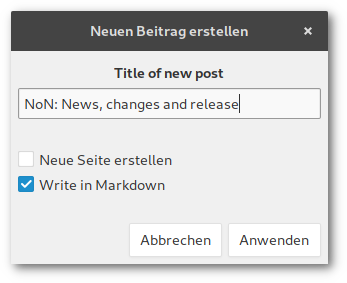 You can now create new posts or pages in Markdown. This option is only available if "markdown" is set in the conf.py's COMPILERS variable. You must also configure the POSTS and PAGES dictionaries, NoN does not check for this and will not throw an error message if not set. The 'Help' button now contains a submenu with links to the Nikola handbook and to reStructuredText and Markdown syntax references so I...ehm you don't have to google them time and time again.